Spectrum is the lab resource group that is targeted towards providing resources for the lesbian, gay, bisexual, transgender, queer and allies (LGBTQA+) community and building awareness to ensure that the laboratory has inclusive policies. What is Spectrum’s vision and long-term goal? Spectrum’s focus is promoting equity at all levels, advancing LGBTQA+ policies and appropriate coverage in benefits plans, promoting an inclusive and welcoming workplace environment, and participating in outreach activities. The goal is to make Fermilab the kind of workplace where everyone can feel comfortable coming out and being themselves — we want the whole person at work, not just a part of a person. 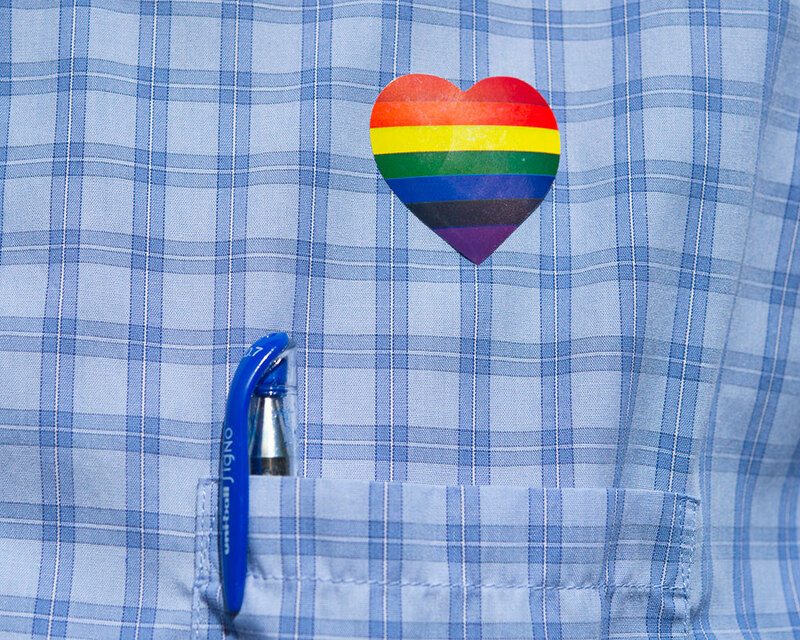 How is Spectrum meeting its goals of promoting an inclusive and welcoming environment? The group’s strategy is to create a visible presence and raise awareness; provide tools for improving workplace inclusivity; and participate in outreach and recruiting. We’re doing some things in all of these areas. Spectrum created a visible presence with, for example, the table at the lab’s recent anniversary celebration, where rainbow heart stickers were passed out. There is also an email list people can join for discussions. One tool the group has developed is having a lunch-and-learn seminar as a place to talk about the LGBTQA+ community in the workplace. At the first seminar, a guest speaker led a workshop on promoting inclusivity among coworkers. Spectrum members are also in the process of developing a safe-zone awareness and training program to promote respect and opportunities to learn about LGBTQA+ issues. To participate in outreach and recruiting, Fermilab is a sponsor this year of the oSTEM (Out in STEM) conference, which will be held in Chicago in November. oSTEM is a national organization that provides professional development and resources for undergraduate and graduate students in STEM fields who are members of the LBGTQA+ community. What is an inclusive workplace, and why is it so important, especially at Fermilab? Part of making an inclusive workplace is understanding where people come from in terms of identity, orientation and expression. Being inclusive means being respectful of everybody. Science thrives by having the best people around and a diversity of ideas. If you exclude any community, then it means you’re excluding potential good ideas. Anybody who is engaged in the lab’s mission should be welcome to contribute. Everyone needs to treat each other respectfully and maintain a professional environment where people can all contribute to the work that Fermilab does and make this the best laboratory that it can be. How can people get involved with Spectrum or support the LGBTQA+ community at Fermilab? 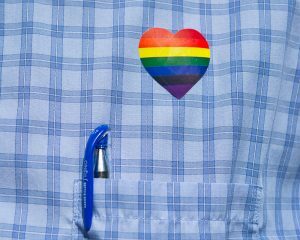 One simple thing people can do is display visible symbols of support, such as the pride flag or a safe-zone sticker (after they’ve done the training) or even the little rainbow hearts passed out at the 50th anniversary celebration. Another step would be to stop before making a key decision and consider its broader impacts on the diverse elements of the Fermilab community. Finally, and perhaps most importantly, people should speak out when they encounter discriminatory behavior or speech. Having allies stand up against discrimination — of any kind — is the most powerful action that individuals can take, because ultimately, it is only through such actions that we create a culture of inclusion and a celebration of diversity.